Day 3 of the Chinatown project found me with limited time for lunch. We were released early but I had a conference call to take so I had to eat quick. Not a problem. 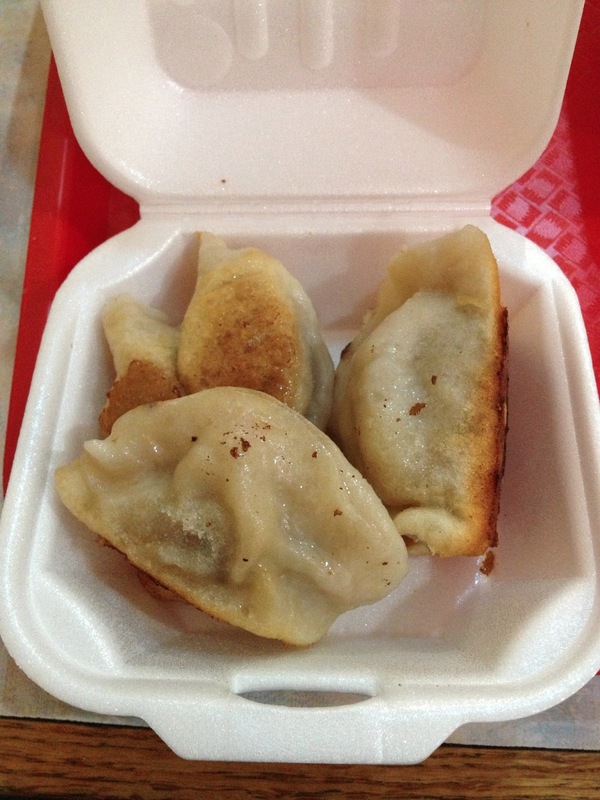 Right behind the courthouses, across Columbus Park on Mullberry Street, sits Tasty Dumpling. Tasty Dumpling is one of the many cheap dumpling spots that Chinatown and the LES are known for. I knew it would be fast and cheap, and I hoped for Tasty. Tasty Dumpling is the proverbial hole in the wall. It is small, dark and beat up. There are a handful of tables to sit at. The other option, on a nice day, is sitting across the street in Columbus Park. I ordered and stayed. Considering the prices, I took the liberty to order a few things besides the dumplings. Here is the recap. This is the namesake dish. 5 dumplings for $1.25. The filling is very good. The wrapper is of the thick and chewy variety, as opposed to the thinner, lighter style. It is the classic Chinese Restaurant dumpling. Best ever? No. Solid and a great value for $1.25. Yes. 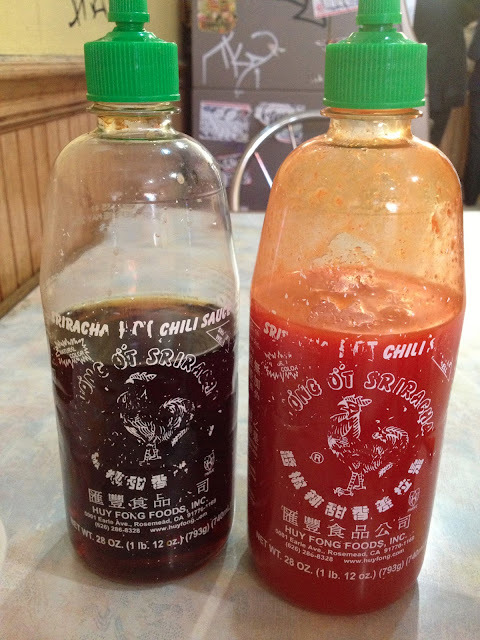 Tasty Dumpling has two Sriracha Sauce bottles on each table. The bottle on the left has their dumpling sauce. Standard fair. The bottle on the right has a watered down Sriracha Sauce. A lot of people complain about it being watered down but I actually think it works to the benefit of the dumplings and other dishes. I tastes like it is cut with vinegar and the result is a nice sauce for the dumplings that has the bite of Sriracha and vinegar tang of dumpling sauce. After tasting it I retired the dumpling sauce and went with the Sriracha. I was expecting something similar to a scallion pancake. Instead I got this. How do I describe this? Imagine if you combined a Sausage McMuffin (but better) and a soup dumpling. This is what you would get. Initially odd, but in the end really quite good. The inside is a solid patty of pork and cabbage similar to dumpling filling.The patty is wrapped in dough that tastes like a hybrid of a dumpling wrapper and English muffin. Like a soup dumpling the interior is filled with broth. It is unique and tasty. I might even prefer it to the dumplings. It is great on it's own but the Sriracha Sauce gives it a nice kick. Noodles with Ma La Sauce can be served either hot or cold depending on your preference. I ordered it hot. The noodles in this dish were fresh and excellent. The Ma La sauce (or Mala sauce) is supposed to be very spicy. Here it was tasty but timid. I would ask them to make it spicier next time. The fresh cool cucumber was a nice balance. Douse it with the Sriracha Sauce and you have got something. This was the sleeper hit for me. 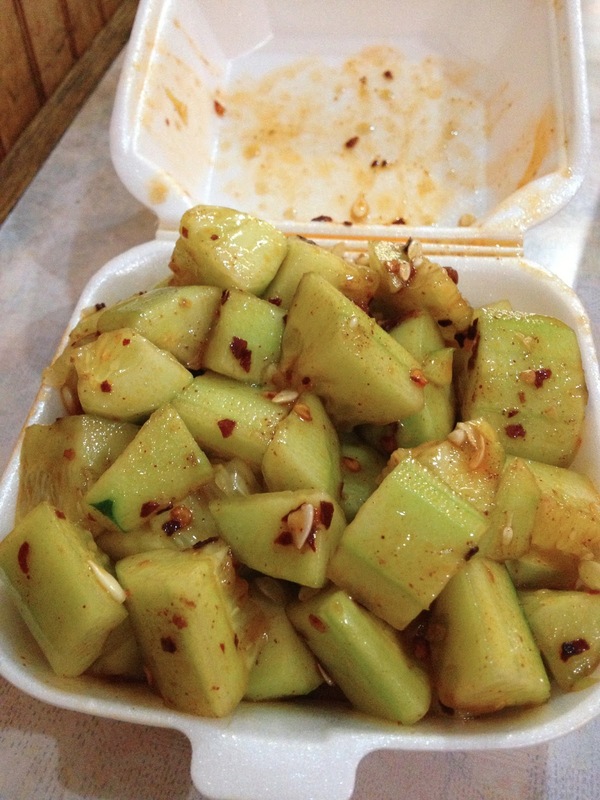 Chunks of fresh cucumber tossed in hot oil with spicy pepper. Simple and delicious. The fresh, cool cucumber contrasted with the hot oil and spices. A winner and one I am going to try and create at home. Cheap, tasty food. That is what Chinatown is all about. I only wonder what will happen if Mayor Bloomberg bans Styrofoam. The price of dumplings may be rise to $1.50. Oh, the horror. Tasty Dumpling - 54 Mulberry Street Between Bayard & Mosco Street.